Definition at line 40 of file llfloaterscriptdebug.h. Definition at line 65 of file llfloaterscriptdebug.cpp. Definition at line 57 of file llfloaterscriptdebug.cpp. Definition at line 100 of file llfloaterscriptdebug.cpp. 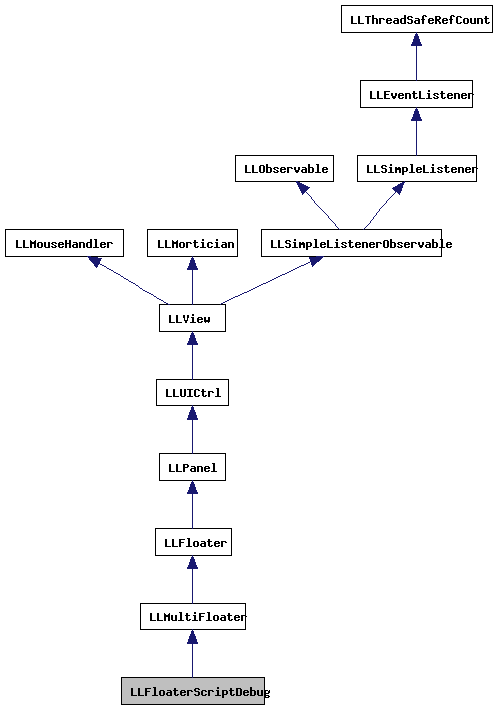 References LLUICtrlFactory::buildFloater(), FALSE, getOutputWindow(), gUICtrlFactory, LLFloaterScriptDebug(), LLFloater::moveResizeHandlesToFront(), NULL, LLFloater::setFloaterHost(), LLMultiFloater::setVisible(), LLFloaterScriptDebugOutput::show(), and sInstance. Referenced by addScriptLine(), and show(). Definition at line 124 of file llfloaterscriptdebug.cpp. References LLFloaterScriptDebugOutput::addLine(), addOutputWindow(), LLViewerObjectList::findObject(), LLFloaterScriptDebugOutput::getFloaterByID(), LLViewerImageList::getImage(), LLViewerObject::getPositionRegion(), LLControlGroup::getString(), gImageList, gObjectList, gViewerArt, llformat(), LLVector3::mV, LLUUID::null, LLViewerObject::setIcon(), VX, and VY. Definition at line 44 of file llfloaterscriptdebug.h. Definition at line 80 of file llfloaterscriptdebug.cpp. 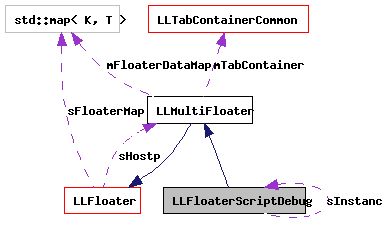 References FALSE, LLMultiFloater::mTabContainer, LLMultiFloater::postBuild(), and TRUE. Definition at line 70 of file llfloaterscriptdebug.cpp. References addOutputWindow(), LLMultiFloater::open(), LLMultiFloater::showFloater(), and sInstance. Referenced by LLShowFloater::handleEvent(), LLToolSelect::handleObjectSelection(), onClickScriptDebug(), and LLToolPie::pickAndShowMenu(). Definition at line 55 of file llfloaterscriptdebug.h. Referenced by addOutputWindow(), show(), and ~LLFloaterScriptDebug().